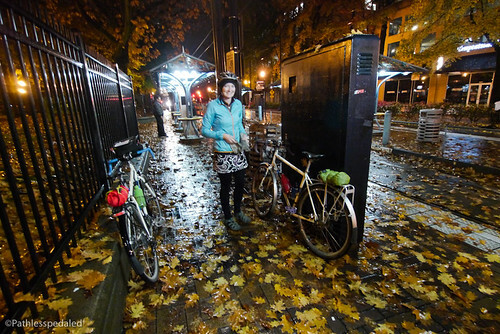 I’ve been interested in the odd bicycle niche of randonneuring for quite a while. It’s a ride but not a race. You’re self-supported but not exactly touring. You wear a lot of wool and use lots of French sounding words. The irony of course is that we’ve been occupied the last few years with our fully loaded touring so I didn’t have the opportunity to give it a try. 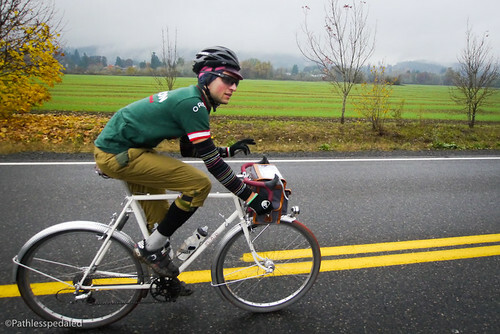 The Verboort Populaire (aka Verboort Sausage Ride) is a 100k ride and is an entry level randonneur ride that allows the bike-curious to see what it is about. While short by randonneur standards (where rides typically begin at 200k all the way up to 1200k in varying degrees of masochism) it does give you a sense of what the whole thing is about. 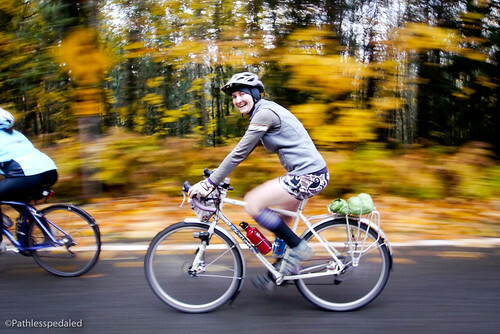 We woke up painfully early at 5:30am, packed our bikes, ate breakfast and poured as much hot coffee down our throats before we had to run out the door to catch the MAX out to Hillsboro. 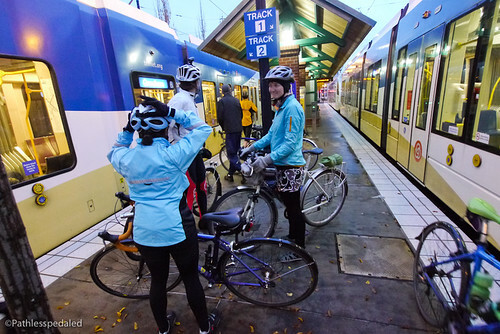 While on the train, we saw other cyclists board the train for the ride. An hour later at the end of the line, we detrained and pedaled 7 miles to Visitation Church in Verboort, OR at the start of the ride. The Verboort Populaire takes place during the locally famous Verboort Suasage and Kraut Dinner which we’ve been told is the community’s largest fundraiser. At the start we pay $5 each ($2 for insurance and $3 towards the fundraiser) and get our cue sheet and brevet card in a Ziplock baggie. During the ride there are control points where you have to get a signature, receipt or some other form of proof that you were at a certain place at a certain time. It adds a fun scavenger hunt aspect to what otherwise would be just a long ride through the countryside. After some announcements, we are off. 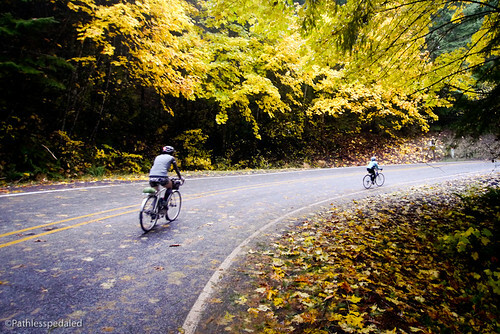 The turn around point was Vernonia. 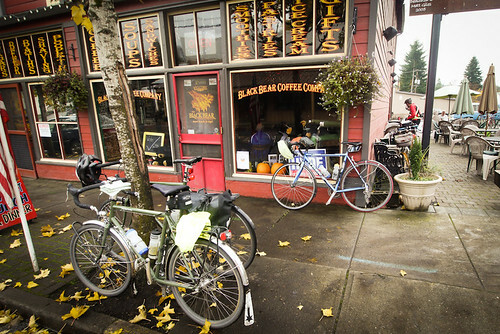 We rolled into the Black Bear Cafe and saw about a dozen other bikes already there. Everybody was chowing down and drinking coffee for the return. Laura and I split a hamburger and fries which was actually pretty spectacular. We’ll have to return again to explore the town some more. After a relatively quick lunch we are on the bikes again to keep momentum and prevent our legs from stiffening up too much. From here back is mostly gravy. 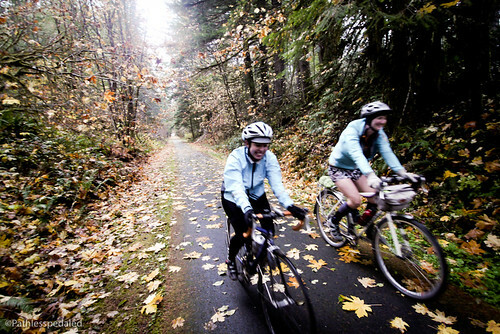 We hop on to the Banks-Vernonia trail and ride the entire length. The first half is a false flat until you summit then it is a pretty cruisy downhill to a flat stretch to the end. There were leaves everywhere on the trail and made for a slippy surface if you braked too hard. At the end of the trail we are on country roads for most of the way back to Verboort. We rode 68 miles and came in under 5 hours and had the appetite to prove it. After handing our brevet cards over we made our way to the Bingo tent that was selling sausages on a stick or on a roll. After devouring a sausage and bun in less than two minutes we were in line for more. The second one might have been a bit overboard especially with all the grease, but when you are blinded with hunger good sense goes out the window. Before our legs get too comfortable we ride the 7 miles back to the MAX stop in Hillsboro and more or less collapse on the train for the hour long ride back into Portland (or more speficially, Velo-Cult for post-ride beers). For our first actual official randonnuering ride we had a lot of fun. There were other newbies that we chatted with as well as some more seasoned riders that offered advice. 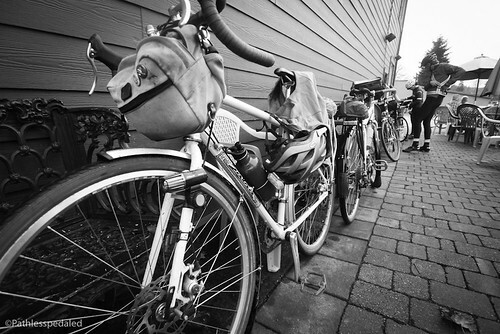 We filtered between a few groups of people and enjoyed the social aspect of riding and eating together. It didn’t have the same hammerhead mentality as some century rides, but it also wasn’t as lackadaisical as touring. For tourists that want to ride a little faster and longer it was a good fit for us. While I don’t see myself doing 400k and 600k events anytime soon (maybe a few more 100ks and a 200k), it was a fun way to finally see what this was all about. It also broadened our riding experience a bit. 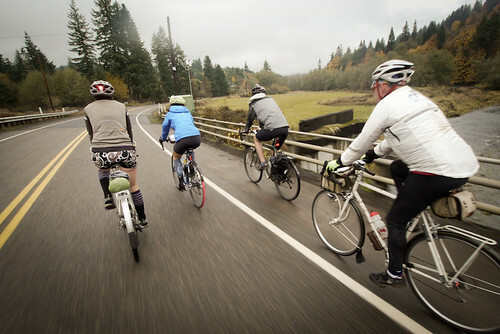 We’ve been a little tired of the same in-town Portland loops we’ve been doing, so it was good to ride some new roads and get outside the bubble. For anyone considering the Verboort Populaire, we highly recommend it. 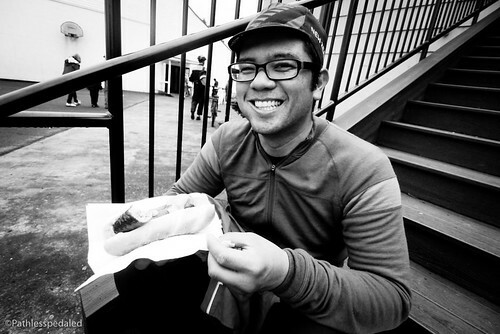 The route was good, the people friendly and the sausages at the end of the ride were a good reward. Nice ride report! 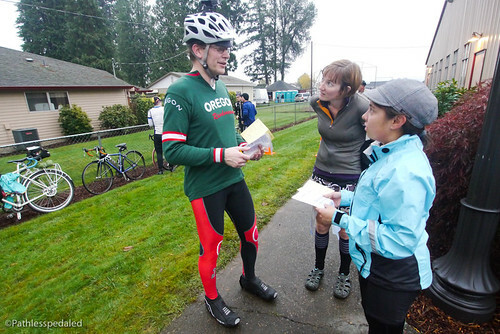 I’m also just getting into randonneuring and signed up to do my first 200k brevet next weekend. 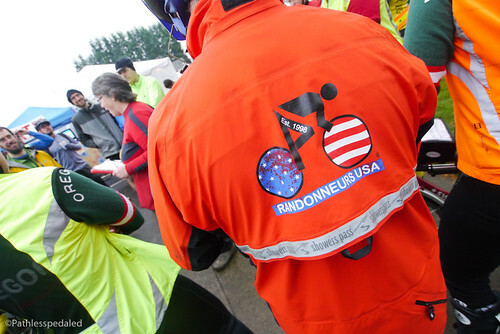 There’s a good group of randonneurs in the Washington, DC area (where I’m from) and they’re great advocates for the rando-lifestyle. I’m similarly hesitant about getting into the 400k and longer rides, but who knows – a year ago I thought 20 miles was a long ride. Hope to hear more about your future rides. And welcome to “The Hotel Randonneur”! 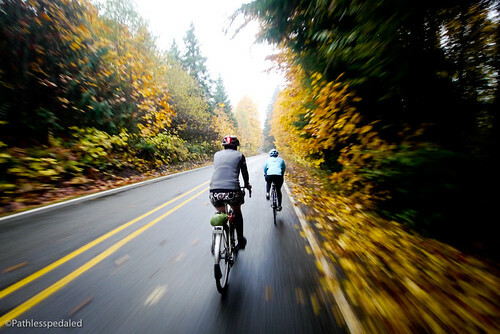 This is a great ride report…. and beautiful photos. Hope to see you next year. Welcome to the club. 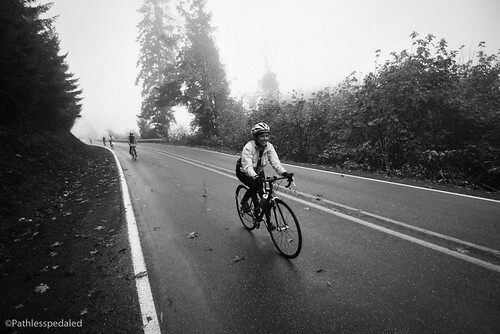 I strongly suggest trying to ride a full brevet series (200k, 300k, 400k and 600k) next year if you can. It really is a lot of fun. For folks like myself who can’t get away for meandering tours, it’s a nice way to see roads and places I might not normally see on a weekend ride. And there’s always great company. Thanks for taking the pictures and writing the report. Russ, which bike did you ride?